The Maasai Mara lies southwest of Kenya in a vast plain of about 1500 square kilometers, covered by grasslands and spotted with acacia trees. The reserve derives its name from the indigenous people of Kenya – the Maasai and the Mara River that cuts through the reserve. It is also the home to Kenya’s big five: elephants, lions, leopards, rhinos, and buffalo. Despite being an important ecosystem, The Mara is under threat from commercial agriculture. The Maasai have lived in harmony with the wildlife for centuries surviving on their cattle for food and other necessities.It is their belief that they came down from the skies on a large cow skin hide with all the cattle in the world. In order for this to happen the Maasai had to make their homesteads permanent as opposed to their tradition of moving from one pasture to the next. This move meant that there would be no more land erosion caused by the constant migration of cattle. 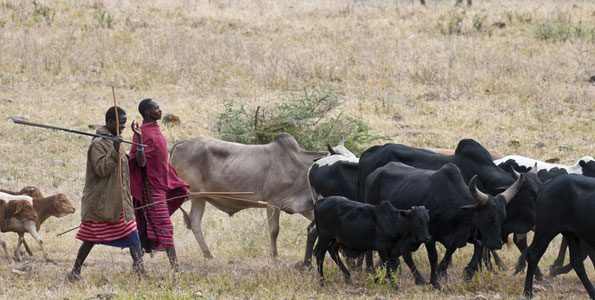 The Maasai now use mobile bomas to graze their cattle. These innovative mobile bomas also play another role in conservation efforts. “The bomas are predator proof; the lions cannot get into the bomas. There are much less lion and community conflict.” Tarquin adds. EnonKishu Conservancy relies on the grasslands for survival. As a result,they have adopted a holistic approach to ensure that this vital food source is available for their cattle and wildlife. When grazing the cattle, they don’t graze down to the lower level. They are moved through the land strategically allowing them enough time to only graze to the half level. What’s left is split between food for wildlife and ground cover to fight erosion during the rains. All these efforts would mean nothing to the community if yields weren’t maximized.That’s why Mara Beef has built an on-site slaughterhouse to get the maximum price per kilo.The result of all these efforts is the production of high quality organic grass-fed beef that raises the economic power of the local community. The slaughterhouse has provided the community with a stable source of income; deterring them from unsustainable practices; saving the environment. This has inspired the local community to do much more.